Outstanding natural beauty is among the first thing you will notice when you visit Dumfries and Galloway, a special place in South West Scotland. farm animals peering over the fence. Dumfries and Galloway also has fantastic inland forests and hills which are amazing spaces to explore, not to mention the amazing night sky, noted as one of the best in the World, taking stargazing into a totally different realm....simply breathtaking. VISIT DUMFRIES & GALLOWAY - YOU WONT BE DISAPPOINTED, WE ASSURE YOU THAT! 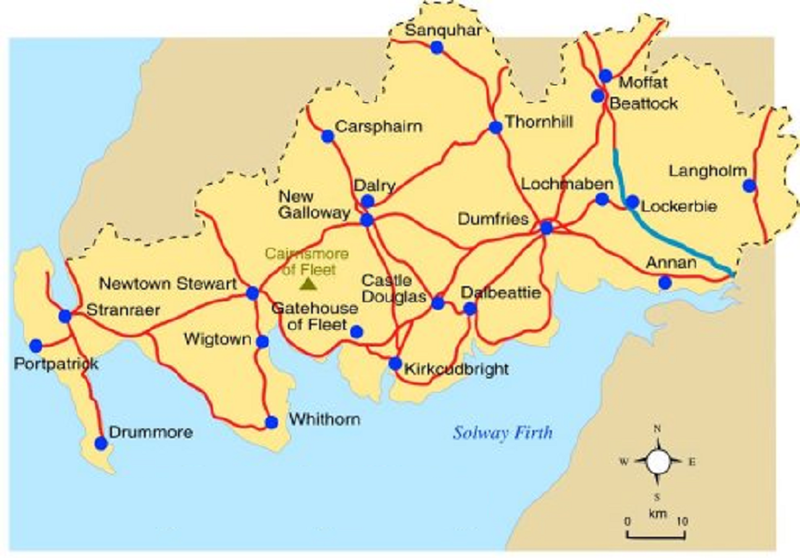 Dumfries and Galloway is one of 32 unitary council areas of Scotland and is located in the western Southern Uplands. Dumfries & Galloway comprises the historic counties of Dumfriesshire, Stewartry of Kirkcudbright and Wigtownshire, the latter two of which are known as Galloway. The administrative centre is the town of Dumfries. To the north, Dumfries and Galloway borders, East Ayrshire, South Ayrshire and South Lanarkshire; in the east the Borders; and to the south the county of Cumbria in England and the Solway Firth. To the west lies the Irish Sea. Such an amazing place to visit - Visit once and you are sure to return! From the rocky and sandy coast looking out for miles across the sea, to the lush green inland forests and hills, it's simply amazing. From the red squirrels and the red deer in the forests to the ospreys and red kites in the sky, there's plenty for you to see and admire. You will be naturally inspired! Dumfries and Galloway is a hidden gem situated in South West Scotland. Glorious green countryside, stunning coastlines, rolling hills and friendly towns. Why wouldn't you want to visit? You will find plenty of activities and fun stuff to do around this glorious region. There's something for all the family to enjoy! explore dumfries & galloway - SOMETHING FOR EVERYONE! Dumfries and Galloway. The animals love it here too. squirrels scurrying around and the roe deer grazing in the fields too. If you’re out and about you may also stumble across Badgers and Foxes at dusk. Ospreys regularly visit the area and if you plan a trip around Loch Ken, you will be sure to see Red Kites flying around in the sky. In short Dumfries and Galloway has an abundance of nature for you to see, whether you take an organised trip or want to explore alone - take your camera, theirs lots to capture - but you better be quick ! !